After several years of excavations, a Roman villa once hidden under a church in Positano is now open to the public. 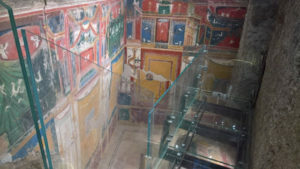 The fresco-covered villa was buried along with Pompeii and Herculaneum when Mount Vesuvius erupted in 79 AD. The villa dates to the second century BC and, thanks to the volcanic eruption, it is well-preserved. Archaeologists have unearthed wooden wardrobes, vibrant frescoes, gilded columns, statues of griffins and hippocampi and bronze pottery. Records indicate that the villa was originally discovered in 1758, but modern archaeologists only rediscovered it in 2003, when they found it under the Church of Santa Maria Assunta in Positano, buried 10 meters deep. Only a small portion of the massive villa has been excavated so far; the entire complex sprawls under all of Positano’s historic center. The discovery is considered the largest archaeological find in the Amalfi Coast in decades. Restoration work, including installing walkways, handicap-access routes and a lighting system, finished in March of this year.